Groundwork lessons with Trish are suitable for everyone. And Especially for people that want More from their horse. What happens in a groundwork clinic? If you signed up to watch the Free interview videos you will have learned some of what we'll start with. High headed, braced and full of adrenaline. It is about developing a common language. One the horse is very familiar with. we can learn to dance together. 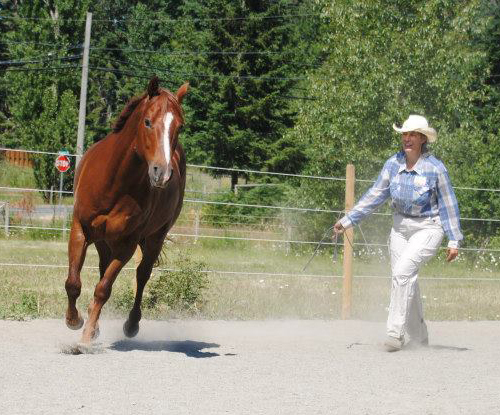 We'll use Push, Block and Draw energies, appropriately, to shape the horse. By telling him where not to go. Most importantly we'll show the horse How to go. The conversation will progress through various levels that may include working on a short line, then a longer line while we learn to assess and align our horse and ourselves both physically and mentally. Ride our horse from the ground. and add in skills that will build towards your final goals, as time allows. come back after lunch to build on your progress or try something new. Your afternoon session can continue with groundwork or you can ﻿RIDE﻿, the choice is yours. Use the form to sign up and use Paypal or your credit card - Best Choice. The proper position for in-hand leading work on true bend is beside the shoulder. That keeps you safe from bites, kicks and striking. 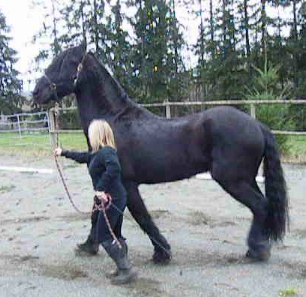 Introduction to work on the lunge includes correct bend and body alignment of human and horse. 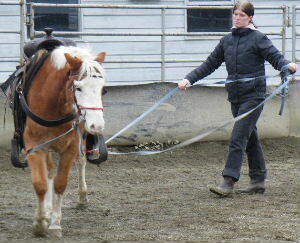 After proper preparation, ground driving allows you to further your communication skills and transition to riding work.